Finding the Best Drum Set For The Money is easier than you think. Here’s a look at our favorites, including our top pick – the Pearl Roadshow 5-Piece Drum Set. 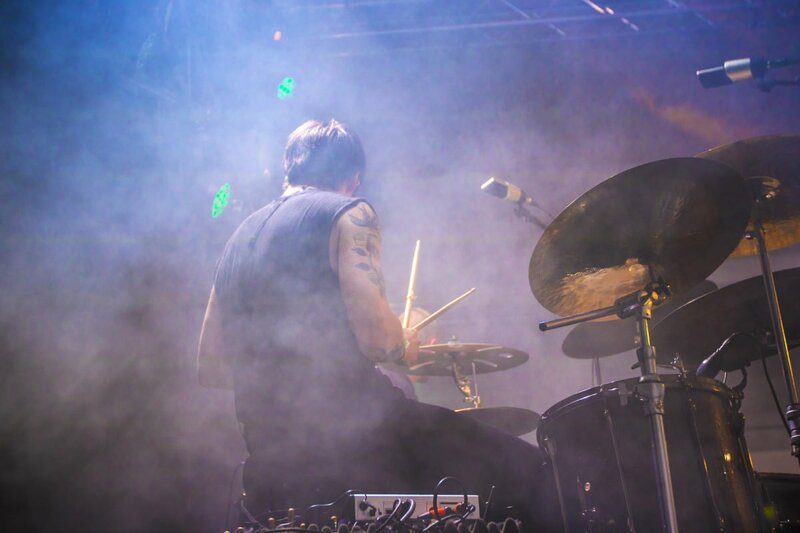 Buying a drum set for the money is easier than ever because there are so many affordable drum kits on the market these days. We’ve compiled 5 of the best into our drummer’s buyer’s guide, most of the options on our list are highly affordable. 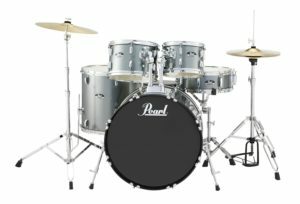 Like our top pick the Pearl Roadshow Drum Set which is under $500, however we’ve also included some slightly more expensive kits in case you have a little more to spend and are looking for only the highest quality. If you’re new to drumming then it’s important not to overspend your hard earned cash. Just go with a drum set that is well within your price range, and play the drums for months, if you’re still obsessed then consider upgrading at that point. 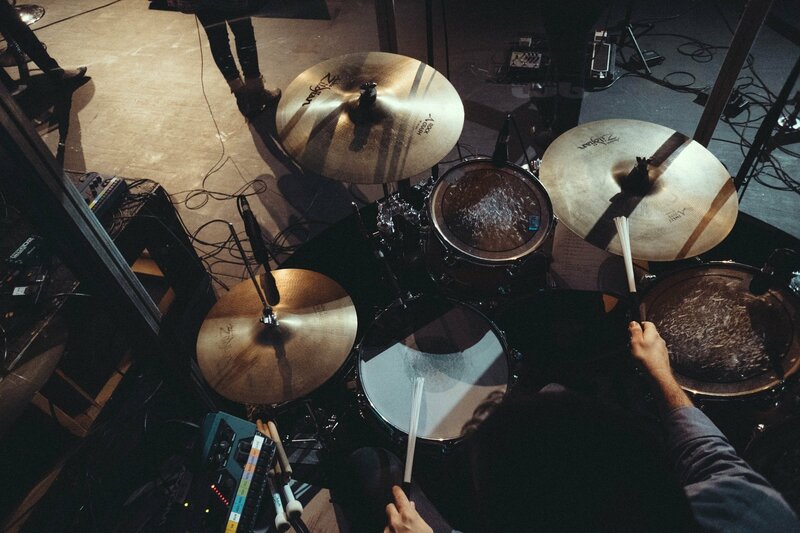 Drums sound better based on the wood and skins that the drums are built with, additionally drum cymbals make a huge difference in your overall tone and cymbals alone can be hundreds of dollars. That’s why these drum set’s for the money are such a great deal, because you get everything you need including cymbals and a kick drum beater all for the price of what you might pay for one high end cymbal. So, let’s go ahead and dive into the 5 best drum sets for the money. 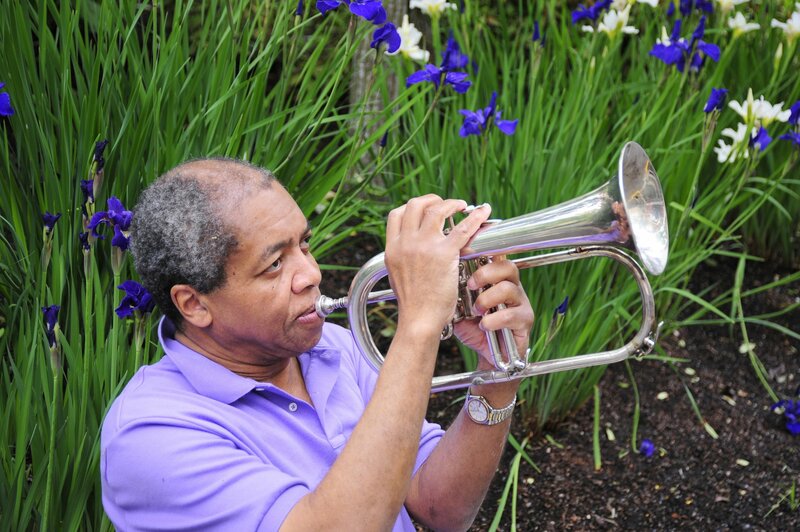 The Pearl RS525SCC706 kit is available in 4 different styles, and 4 different colors. 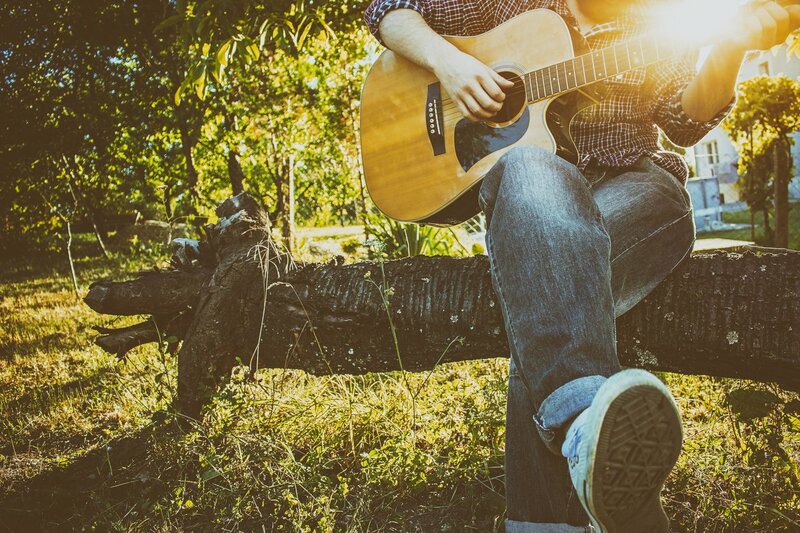 These styles include rock, jazz, fusion, and new fusion. If you don’t know what style you need, then let us recommend the rock kit for you. So, on top of this customization you can choose the colors which include jet black, wine red, bronze metallic, and the charcoal metallic pictured above. With so many customization options, it’s no wonder this kit is such a hot item, this is clearly an excellent drum set for the money. The Pearl kit comes with everything you need to get started drumming, including everything you see pictured, all stands and a bass kick beater. 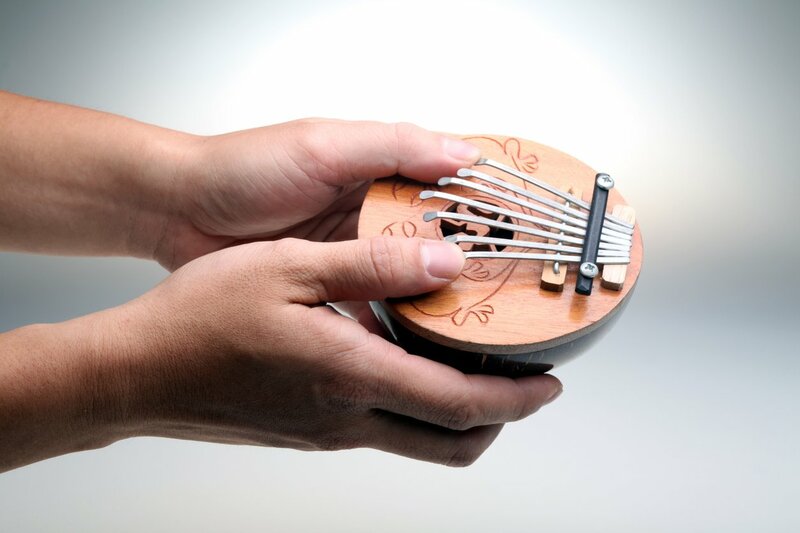 It even comes with a seat and some sticks, as well as drum key that you should keep handy to adjust all of your tensions. Our 2nd choice is a number one best seller on Amazon, and for good reasons. You’re getting a complete drum set for adults that includes a high hat, crash cymbals, sticks, stands, and a drum chair. It even comes with a kick drum beater so you literally only have to buy this kit and you’ll be drumming like a pro in no time. This is the ultimate all in one package, and once you’ve outgrown the limitations of this kit, you can upgrade, and now you’ll have the required knowledge to pick out your professional kit. Or, just keep this kit around and teach your kids how to drum with it, it’s a resilient and reliable kit with a good enough tone to keep you jamming for hours. 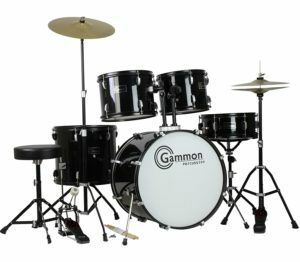 The Gammon Percussion Full Size Complete Adult Drum Set has hundreds of positive customer reviews across the web. Additionally, there’s the option to buy the kit in all blue, but both color variations really look great. 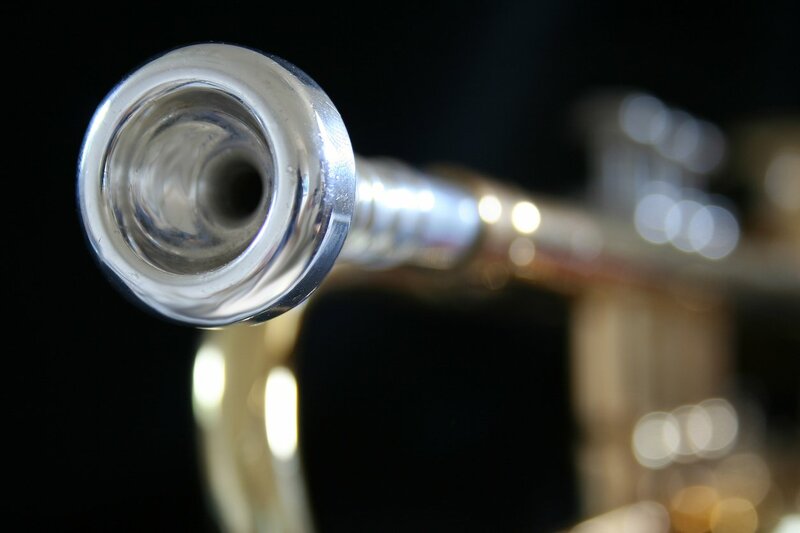 The Ludwig Accent Drive is a great choice for 1st time drummers or intermediate players. Customers have called it an awesome entry set, and have mentioned that it was very easy to build upon arrival. Ludwig is a trusted name in the drumming industry, and you shouldn’t hesitate to pick up this drum set if you’ve been waiting for an excuse. The Ludwig Accent Drive will stand the test of time as you learn your chops, and ultimately your way around the kit. 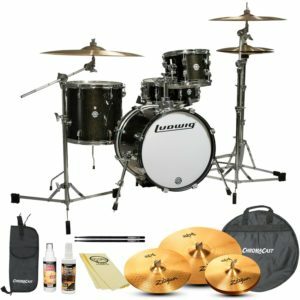 This 5 piece kit includes hardware, cymbals, sticks, drum throne, and a kick pedal. Essentially, this kit has everything you need to get started drumming, all for an affordable price so you can still upgrade later if you feel the need. Everybody knows Questlove, drummer for the band The Roots, and for particularly ecstatic fans there’s the Ludwig Breakbeats by Questlove. 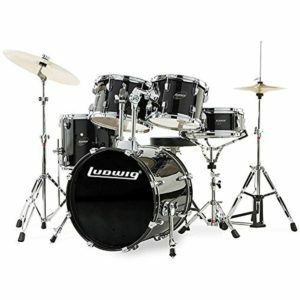 This is an excellent drum set for drummers who want an affordable kit from a huge brand name in the industry. The Ludwig Breakbeats by Questlove comes with everything you need to start drumming, and some additional extras for those drummers who are looking to gig. The Ludwig Breakbeats by Questlove kit includes cymbal bags, some extra cleaners for your kit, and also a drum stick bag. The Zildjian cymbals included in this drum kit are excellent, and Zildjian is well renowned & known for their ability to make high-end cymbals for serious drummers. One other huge component of this drum kit is that it’s built to be portable, therefore this kit sort of lends itself to drummers who are looking for a drum set that they can use in all walks of their career, including touring. 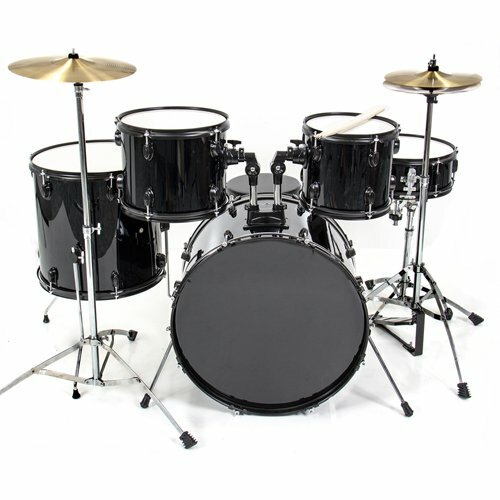 Our last choice is the Best Choice Products Drum Set a full sized complete drum set designed for beginners, or someone that wants an affordable extra kit for practicing. The drum set comes with the hi hat, cymbals, stands, drum chair, and sticks that you need to setup and jam. The Best Choice Products Drum Set comes with easy setup instructions and is made of premium quality components, with a high gloss silver finish, and chain driven kick and hi hat pedals. With over 200 positive customer reviews, an average Amazon rating of 4 stars, and a price tag of $199.94 it’s hard to find a more affordable kit than the Best Choice Products Drum Set.